She came in the mail this morning and I haven’t regained my senses yet. 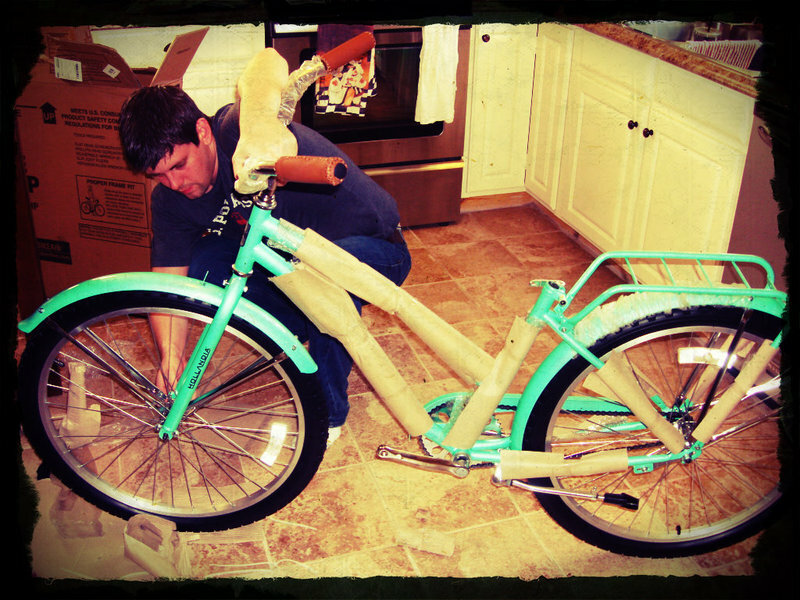 Here’s the husband putting her together in the kitchen. Nothing like having an aerospace Quality Manager put things together for you–if the helicopters fly then the bike should ride (we hope). I decided to take her out for her maiden voyage, all along telling Husband what an avid bike rider I was all through my youth and pretty much laid it out that I was pro. Probably shouldn’t have done that. I almost died. I went like a 1/4 of a mile and my knee was aching and I was panting for air. Sooo, I guess I’m a little out of shape–fail. Here she is in her new home–our living room. She can’t live outside because I’m fairly certain one of my various pot-infused neighbors will take her for a spin and then I would have to chase them down and we would fight to the death–not ideal if you ask me. So, I vote she lives in the living room. Husband says she has to live in the basement. Silly Husband. Does he really think I’m going to let him put my sweet little bike in that dark abyss? No, I win; she lives in the living room. I have lots of plans for my little bike–camping trips, racing the nephews, national parks, days at the beach…just as soon as I get my 26 year old knee and lungs whipped back into shape–who knew I would get so old so young? That’s what living in the city does to you, I say. Get me outside! I bought the basket separately from Peterboro Basket Company located in Peterborough, New Hampshire. They hand-make their baskets right here in the USA using all American products…love that, love supporting local business when I can. So, what are your plans for the warm weather days? This entry was posted in Archives + Other and tagged Cycling, Life, Outdoors, Photography, Vintage. Bookmark the permalink. ← Are You a Downer? Great story about your bike. I can remember when that retro style was brand new. 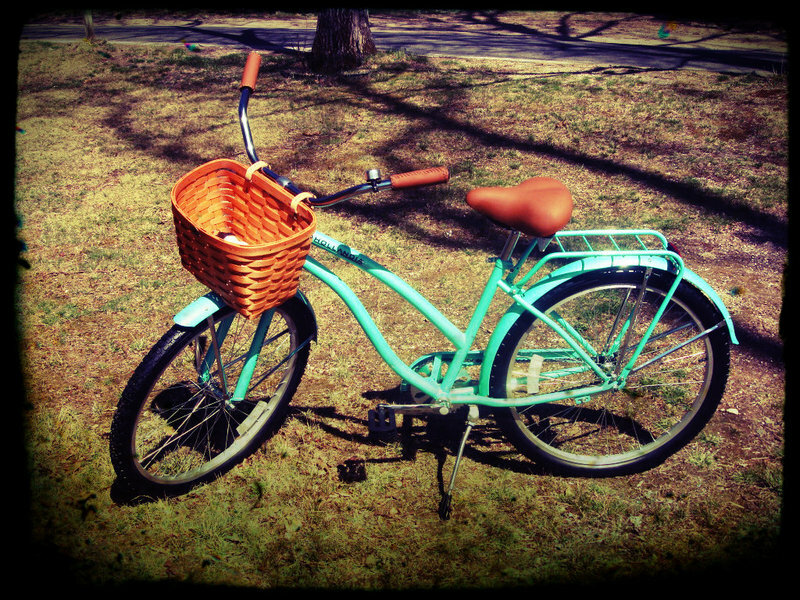 I wrote a post about my Schwinn “Flying Star” you may want to check out. I learned about you when you were “pressed”. I like the way you write; you appear to be a thinker. Keep living and writing about your faith. That is a very cute bike! What a great bike! I want one too! Beautiful bike! And nothing better than to ride a bike at the end of a day in Spring. She is a sweet bike! Do you have a name for her? I LOVE your bike! Mine isn’t nearly as cute but now that the snow is nearly gone, I can’t wait to take it out of the shed where it’s been hidden away all winter. And I have good news… the doctor recently told my husband that cycling would be good for his gimpy knee. I hope it’s also true for you and I! 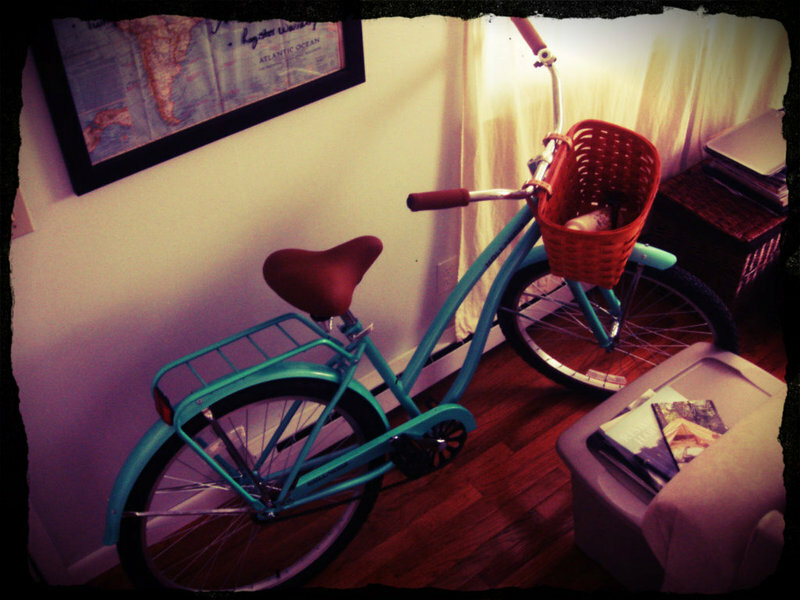 A darling bike with a darling little bell and a darling basket too boot. I do hope you are wearing a darling helmet to protect your darling head. I’m sure you are a darling addition to the streets of New England. I am also a26 year old who decided I could take up biking again. I bought it a while back and rode it about a mile away from home. Once I got out there I realized I had to get it back. Very disappointing considering I used to ride all day when I was younger and not tire. I didn’t realize how old I was. The bike is now parked under the porch at my parent’s. I plan to try to relearn to ride it once I move to the city. Good luck with yours! I only have one question to ask you, who ever told you you were normal? I can’t even imagine how boring our life would have been when you were growing up if that was true!! Kari, thanks for sharing this story. I like anything nostalgic in nature. Retro all the way…Sometimes, we just need to slow our lives down just a little bit and enjoy the simple pleasures in life. Who knows, you might just come up with some incredible writing material as you pedal around on your little green two wheeled bicycle which by the way sounds much more nostalgic than say you “bike” wouldn’t you agree? That is awesome. Looks like it came right out of Free People. Enjoy!!! very exciting! I love it.